Proclaim your love for your favorite animal by putting it front and center where everyone will see it - on your hand! This is a large ring (hippo-sized, even) that is fun and fashionable for hippo fans of any age. It's polished to a high orange shine that is sure to stop traffic. 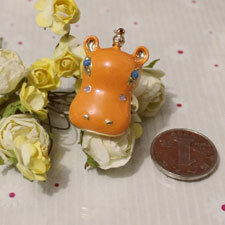 The hippo head features piercing blue cubic zirconia eyes with gold details.